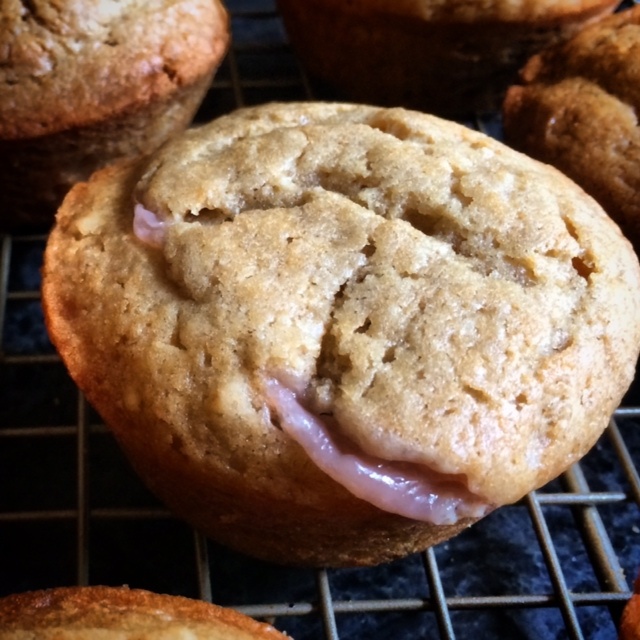 A peanut buttery muffin with creamy, jelly-filled center trumps the PB & J sandwich any day. Its peanut butter isn’t sticky and its jelly doesn’t ooze all over the place. Plus, what child wouldn’t be pleasantly surprised to see frosting-like jelly inside. The “frosting” actually contains some protein (cream cheese), which complements the amino acids in the peanut butter…shhh, don’t tell! These muffins are quick and easy to prepare, requiring two mixing bowls and a whisk. They are fluffy, moist, soft and light. Perfect for breakfast, brunch, or snacks. For the milk, substitute unsweetened vanilla almond milk or soy, cow, rice, goat, or coconut milk. For the jelly, use strawberry jelly, jam, or preserves (or raspberry, apricot, raspberry, grape or cherry). For the peanut butter, use soy nut butter. 1. Preheat oven to 350 F. Grease muffin pan with cooking spray or line with paper liners. 2. In a large mixing bowl, whisk together the flour, sugars, baking soda, baking powder, and salt. 3. In a separate mixing bowl, whisk egg, buttermilk, milk, peanut butter, oil and vanilla extract. 5. Spoon batter into greased muffin pan, filling each muffin cup about 1/4 full. 6. In a separate mixing bowl, whisk cream cheese and jelly. 7. Spoon 1 tsp jelly filling onto each muffin cup. Top with batter to ¾ full. 8. Bake 20 to 25 minutes, or until tops are golden.